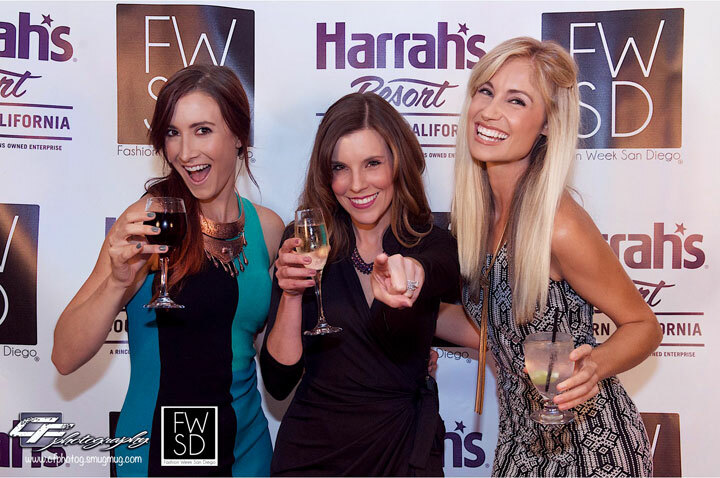 Fashion Week San Diego hosted the first ever Culinary Couture event on Saturday, July 16; a delicious culinary adventure through seven of the world's fashion capitals. A select 200 of Southern California's fashion obsessed donned duds as appropriate front row at a runway show as at a dinner table, and ventured out to the majestic tropical oasis of the desert that is Harrah's Resort Southern California, for a meal that embodied the true spirit of Haute Couture. Accompanied by husband and Executive Producer of Enjet Media, Matt, and our fabulous Project Manager, Erin, I decided to take full advantage of all that Harrah's Resort has to offer and turn our savory sojourn into a full-blown weekend outing. What could be more fashionable than relaxing beneath towering palm trees, sipping a seasonal cocktail, and floating a sparkling lazy river with the team of Fashion Week San Diego? Although the Culinary Couture event was the core of our amazing weekend, we decided to kick things off a little more....wildly. In swimsuits and sunglasses on a sweltering late summer day, we headed out to the stunning pool area for Harrah's signature Saturday party: Dive Dayclub. Between the massive resort style pools, pumping bass of the Coachella worthy DJ's, and hundreds of attendees from all over the West Coast, Dive proved to be the party of the summer. We felt like we found the ultimate Vegas hot spot - but we were only 45 minutes from home! By the end of the day, we had definitely worked up an appetite, and were so ready for a culinary adventure. FWSD outdid themselves with a VIP purple carpet, leading into an insanely stunning ballroom that looked straight out of Paris Fashion Week. Vibrant, luminous custom centerpieces by The Gifted Horse added the final touch that blew us away! Harrah's Resort chefs handcrafted a spectacular seven course meal complete with drink pairings; each themed around a fashion capital of the world. You may think I'm exaggerating when I say this is the best meal I've ever had, but it was truly that incredible. Spanning from bright seafood to decadent truffles to coconut ice cream created with liquid nitrogen - every bite not only tasted out of this world, but was as beautifully curated as the couture fashion from each city. So delicious, I swear I'm still dreaming about it! We ended our weekend recovering from all the amazing food; relaxing in our comfy rooms, sipping fresh watermelon margaritas by the pool, and enjoying a little sunshine and the perfect mini-holiday with our friends from Fashion Week San Diego. It might have only been one weekend, but it was the best vacation we took all summer. And definitely - the tastiest.